Still Life with Spirit and Xitle features a car being crushed by a volcanic boulder with a comical smiley face painted on it. 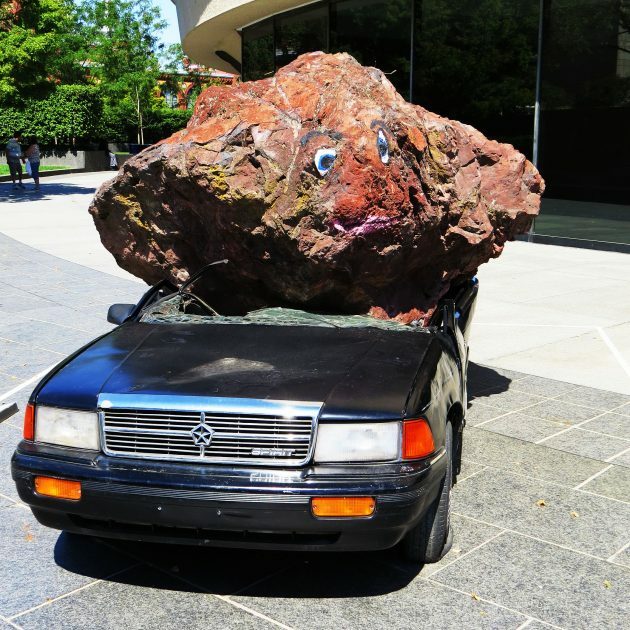 This slapstick disaster scene is one of the most well-known works of art by artist Jimmie Durham, a sculptor who is known for his sense of humor and irreverence. Xitle (shy-tuhl) means, “spirit,” which is the name of both the Dodge model of the car and the volcano from which the rock was quarried. Deceptively simple, Still Life with Spirit and Xitle is intended to capture the clash between industrial and ancient spirits.